+ At the Workbench: Attention Kit Builders -- The ARRL Wants to Hear from You! If you missed the 2012 ARRL National Convention -- held October 12-14 in Santa Clara, California -- or you just want to relive the fun and excitement, be sure to check out a recap of all the events on Friday, Saturday and Sunday. There's also a great bunch of photos from the Convention on the ARRL's Facebook page. 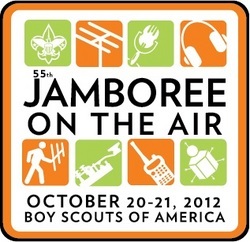 The 55th annual Jamboree on the Air (JOTA) is October 20-21. This 48-hour event runs from 0000 (local time) on Saturday, October 20 (right at midnight Friday) through midnight (local time) on Sunday, October 21. JOTA is an opportunity for Cub Scouts, Boy Scouts, Girl Scouts and Girl Guides from all over the world to experience the magic and excitement of Amateur Radio. According to Boy Scouts of America JOTA Organizer Jim Wilson, K5ND, more than 250 JOTA stations have registered with the BSA; stations do not need to register with the BSA to participate in JOTA. "We estimate that there will be nearly 17,000 Scouts in 45 states, Puerto Rico and a few countries on the air for JOTA," Wilson told the ARRL. "We have compiled a spreadsheet that lists locations, call signs, detailed contact information, bands and modes for these stations. We invite hams to use this information in their JOTA activities." Read more here. The Seventh Annual ARRL On-Line Auction opened for preview on Tuesday, October 16, and will open for bidding at 10 AM EDT (1400 UTC) on Thursday, October 25. According to ARRL On-Line Auction Coordinator Lisa Tardette, KB1MOI, there is a large assortment of ARRL Product Review items, including an Elecraft KPA500 HF/6 meter power amplifier, an ICOM IC-7410 HF/6 meter transceiver, a Yaesu FT-450D HF 6 meter transceiver, a Kenwood TM-281A 2 meter FM transceiver and an MFJ-998 RT and MFJ-994BRT remote auto antenna tuner. The ARRL On-Line Auction also features a wide assortment of books, including ARRL Handbooks from the 1920s and 1930s -- most notably, a first edition of the 1926 Radio Amateur's Handbook -- and a set of three first-day-of-issue covers of the 1964 5-cent stamp highlighting Amateur Radio (see an image of a stamp here). "Once again this year, bidders will find a large variety of product review equipment, vintage books, novelty items and a number of very special items that have been donated by the crew of the ABC Television's Last Man Standing, starring Tim Allen as Mike Baxter, KA0XTT," Tardette explained. "In order to place a bid, you must register on the ARRL On-Line Auction website. You may browse the website and scope out those 'must-have' items without being a registered bidder, and you can register at any time during the auction. If you are interested in some great bargains -- and some great fun -- you really need to check out the ARRL On-Line Auction." 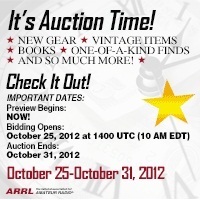 The 2012 ARRL On-Line Auction runs through 11:45 PM EDT on October 31 (0345 UTC November 1). Contact Tardette via e-mail with any questions concerning the ARRL On-Line Auction. ARRL Media and Public Relations Manager Allen Pitts, W1AGP, has retired from the ARRL after more than eight years of service. 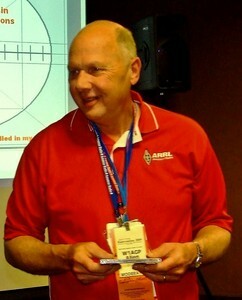 After more than eight years as the ARRL Media and Public Relations Manager, Allen Pitts, W1AGP, has retired. During his tenure, Pitts was responsible for developing public relations campaigns that featured the many facets of the Amateur Radio Service: Hello Radio came first in 2006 and highlighted the fun and friendships of ham radio. It was followed by Emergency Radio, which built on the ARRL and the Amateur Radio Service's response during Hurricane Katrina. We Do That -- Radio in 2008 showed the technologies used in Amateur Radio. In 2011, the Do It Yourself (DIY) campaign was unveiled. Building a corps of Public Information Officers (PIOs) throughout the country, Pitts believed that all news was local. "With this in mind," he explained, "I felt the best use of ARRL resources was to provide local PIOs with the very best materials we can and let them use them in their home areas." The strategy obviously worked, as the number of PIOs volunteers increased. "There are almost 200 graduates of PR-101, more than 500 subscribers to the PR e-mail reflector and the number of media hits about Amateur Radio grew larger and larger." Read more here. The US Postal Service has announced that as of January 27, 2013, the cost to mail First Class letters, postcards and packages within the US will go up. The cost to mail a first class letter will be 46 cents, while the cost to mail a postcard will be 33 cents, an increase of 1 cent for each. This is the third increase for postcard postage in less than two years; in April 2011, the USPS boosted the postcard stamp price from 28 cents to 29 cents, and from 29 cents to 32 cents in January 2012. The USPS will also introduce a First Class Mail Global Forever Stamp in January. This new stamp will allow customers to mail 1-ounce letters anywhere in the world for one set price of $1.10. The cost to mail flat-rate Priority Mail packages and letters will also increase. Click here for more information on all the 2013 postal increases. Video overviews of the Array Solutions AIMuhf impedance analyzer and the DZKit HT-7 40-meter AM handheld transceiver. A circuit board layout and additional information on how to bring your vintage receiver and transmitter together with the "Boat Anchor Buddy," by Ralph E. Taggert, WB8DQT. Build an inexpensive HF power attenuator. Learn a different way to assemble PL-259 plugs. Put your remote antenna tuner to work on 160 meters. Turn back the clock with an easy single-tube transmitter. 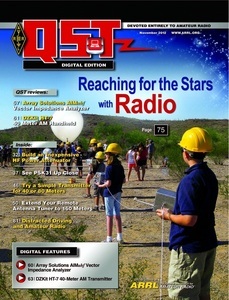 See how students "Reach for the Stars" with Amateur Radio. Tedd Rappaport, N9NB, was named the recipient of the IEEE's William E. Sayle Award for Achievement in Education. Ted Rappaport, N9NB, of New York City, has been named the recipient of the 2012 William E. Sayle Award for Achievement in Education, given by the Institute of Electrical and Electronics Engineers (IEEE) Education Society. This prestigious award is presented annually to an IEEE Education Society member who has made significant contributions in engineering education. Rappaport, an ARRL Life Member, is a Professor of Electrical and Computer Engineering at the Polytechnic Institute of New York University. According to the university, Rappaport was selected to receive the award "for his exceptional technical and varied contributions in the creation of research centers, educational books and software and for the creation of products in the wireless industry." Read more here. The ARRL wants to hear from kit builders about simple, useful, educational and exciting kits. These kits should have a high probability for success and would serve as stepping stones for more advanced projects. We are looking all sorts of kits, but RF detector kits that work in the 380 MHz-2.5 GHz range are of special interest. The kits should also have a "Wow, I built this and it works!" factor. If you know of such a kit, please let us know by filling out a simple form here by October 31. The Sun, as seen on Thursday, October 18, 2012 from NASA's SOHO Extreme Ultraviolet Imaging Telescope. This MDI (Michelson Doppler Imager) image was taken in the continuum near the Ni I 6768 Angstrom line. The most prominent features are the sunspots. This is very much how the Sun looks in the visible range of the spectrum. 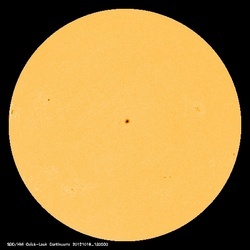 Tad Cook, K7RA, reports: Sunspot activity rose this week, with the average daily sunspot numbers up more than 45 points to 97, while the average daily solar flux rose more than 24 points to 129.2. We saw high geomagnetic activity on October 12-14, with the planetary A index at 12, 38 and 19, the college A index (in Alaska) at 18, 70 and 33 and the mid-latitude A index (measured in Virginia) at 12, 28 and 20. On October 13, a solar wind spilled through a gap in the Earth's magnetosphere, making for unsettled conditions, and aurora were seen across the northern tier states in the US. The latest prediction is for the solar flux to peak at 135 (not at 150 as predicted earlier) for October 18-21, 130 on October 22-23, 125 on October 24, 130 on October 25-28, then down to 125, 120, 115, 110, 105 and 100 for October 29-November 3, and then 105 on November 4-5, peaking again at 140 on November 12-14. The predicted planetary A index is 8 on October 18-19, 5 and 8 on October 20-21, 5 on October 22-November 7, then 10, 20, 15, 12, 8, 8, 10 and 8 on November 8-15, and down to 5 again on November 16 through the end of November. Look for more on the ARRL website on Friday, October 19. For more information concerning radio propagation, visit the ARRL Technical Information Service Propagation page.